Review, Vol.1, Issue 2, pp.16-20. International Journal of Ikebana Studies, 1, p.31-52. 2007 The Effect of Suggestion on Tertiary Students’ Attribution and Self-Concept. Education Research and Perspective, 34 (1), 179-197. 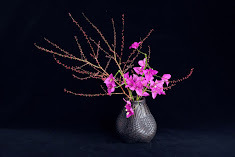 2009 February to date, Monthly Ikebana column, “Hana o Tomeru” Dengon Net. 2009 Spiritual Development through Ikebana, Living Now Annual, pp.8-11. 2007 Ikebana and Haiku. Living Now, August, p.11. Academic Forum. April 2-4, Osaka, Japan. Academic Forum. May 24-26, Osaka, Japan. 2013 International Floral Art 2014/2015, p.232. Oostkamp: Stichting Kunstboek. Australian Flower Industry Magazine, Mar, pp.36-8. 2012 ABC Radio, 30 March. 2012 Floral Design Magazine, Feb, pp.38-53. 2011 Leader Newspaper, Stonnington, 8 Nov.
2010 Melbourne Weekly, p.34, 10 Nov.
2009 Nine AM, Channel 10, October. M, The Sunday Age, March 29, p.20. 2008 Postcards Magazine, Issue 3, p.56. 2006 Caulfield Leader, 2 May. Dumbo Feather, Issue 7, pp.50-67. Master of Ceremonies, Belle, January, p.188. Garden Gurus, Channel 9, May. 2005 City Weekly, 8 September. 2004 Australia's top floral designers, Belle, September, p.106. Good Morning Australia, Channel 10, 29 June.